Tree death rates have more than doubled over the last few decades in old-growth forests of the western United States, and the most probable cause of the worrisome trend is regional warming, according to a U.S. Geological Survey-led study published in Science on Jan. 23. The study found that the increase in dying trees has been pervasive. 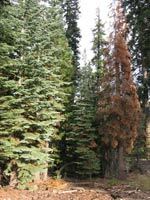 Tree death rates have increased across a wide variety of forest types, at all elevations, in trees of all sizes, and in pines, firs, hemlocks, and other kinds of trees. Regardless of the cause, higher tree death rates ultimately could lead to substantial changes in western forests, said Phil van Mantgem, a USGS scientist and co-leader of the research team. Such changes, the team noted, can have cascading effects, such as by changing forest suitability for wildlife species. Additionally, increasing tree mortality rates mean that western forests could become net sources of carbon dioxide to the atmosphere, further speeding the pace of global warming. The study's authors ruled out a number of possible sources of the increasing tree deaths, including air pollution, long-term effects of fire suppression, and normal forest dynamics. In contrast, increasing regional temperature was correlated with tree deaths. "Average temperature in the West rose by more than 1° F over the last few decades," said van Mantgem. "While this may not sound like much, it has been enough to reduce winter snowpack, cause earlier snowmelt, and lengthen the summer drought." The lengthening summer drought could be stressing trees, leading to higher death rates, he said. Warmer temperatures also might favor insects and diseases that attack trees. Some recent outbreaks of tree-killing bark beetles in the West have already been linked to warming temperatures.